Balancing your checkbook was critical, since there was no online account history you could check. You had to document every transaction in the checkbook register for keeping an accurate running balance. You got a statement once a month, which you would use to double check your work – and the work of your financial institution! With modern technology, many people don’t bother to balance their checkbooks any longer. Most transactions that had been made with a check are now made with a debit card. Many consumers don’t even carry a checkbook, which means no register. But who cares, right? You should! Balancing your checkbook can still do wonders to improve your financial awareness and security. Let’s look at the hows and whys of this “ancient” art and what mastering it in the 21st century can do for you. At its core, a check register is just a running list of credits and debits (money in and money out). You could just keep a notepad, but it would be easy to lose. Plus, it’s just one more thing to carry around. It’s much easier to put something you already have to work. 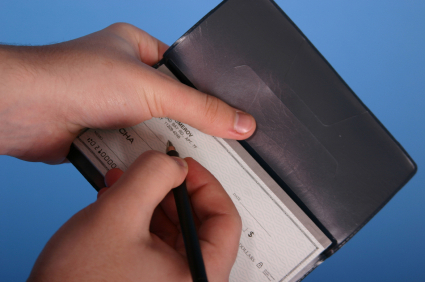 If you always carry a checkbook, the pages in the back can still be an effective check register. If you’d like something a little more modern, there are plenty of options. A quick check of an app store shows more than a dozen checkbook balancing apps for both iPhone and Android devices. If you’re looking for something shareable, a Google Sheet that you and your partner share could help with a joint account. Whatever you use, the process is the same. You write your current checking account balance on the first line. Whenever you write a check or use your debit card, you write the check number if it’s a check, the date of the transaction, a description of the transaction, and the amount. Follow a similar process for online bill payments or automatic withdrawals. Then, subtract the debit from your balance and write the new balance next to the transaction. Any time you add money to your account (a credit), do the same thing, but adding instead of subtracting. Once a month, sit down with your checkbook register and compare it to your account statement. Put a checkmark next to items that appear on your account statement. This is called reconciling your checking account. The most obvious reason for keeping your checking account balanced is to have constant tracking of your finances. You’ll never have to worry if this tank of gas is going to put you in the red or that you can’t really afford to meet friends for drinks. In fact, this method can actually provide you MORE security than checking your balance on a smartphone app. Different transactions process at different speeds. If you run your debit card as a credit card, that transaction goes to a payment processor, then to your credit union, then back to the payment processor, then to the merchant. The whole process can take as much as 3 days (more if it is over a holiday weekend). If you use your debit card at a busy restaurant, the manager may not get around to processing the receipt until a day or two later. Of course, if you write a check, the person you write it to may forget about it until the next week! All of these can cause your account balance to inaccurately represent your funds available. By updating your account balance as soon as you make the transaction, you can avoid the chain of overdrafts that can really put you in a bind. Even if you never have a problem with your account balance, the security that comes from being sure is invaluable. You can’t put a price on that peace of mind. Double-confirming your transactions is a great way to stay ahead of identity thieves and other forms of fraud. Because you’ve documented all your transactions, you should be able to quickly spot any irregular expenditures. You’ll be able to spot stolen cards, fraudulent purchases and merchant overcharges quickly, and your record will be an excellent form of evidence on your behalf. A lot of us have monthly subscriptions we’re not using. Maybe you signed up for a free trial of a cloud storage product or music streaming service and forgot to cancel. Maybe it’s a magazine subscription you thought you canceled a year ago. Whatever it is, it’s easy enough to not think about it. When you perform your reconciliation and really examine your statement, you’ll see your spending habits differently. You’ll see (and have to record in your register) all those little expenses. This makes a great time to cancel those recurring charges! Being forced to write down all your spending also forces you to put an extra step between desire and gratification. Would you really be so quick to whip out plastic to grab a snack if it meant an extra transaction to record? Could you, at the end of the month, justify all those daily indulgences? Keeping records can be a great way to get your spending under control. Keeping a checkbook register might seem like an outdated habit, but knowing where your money goes is a timeless need. If you would like help setting up a checkbook register or want to better understand how you can take charge of your finances, call, click, or stop by Destinations Credit Union today! It might be the first step you take on the road to financial security.